When naming my characters for The Mark, I chose names from the history books, mixing first and last names of various people until they fit my visions for these characters. By doing this, I got to know more of the people involved in the hysteria of the day – the accusers, the accused, the condemned and the freed. My heroine is Abigail Prescott, though she’s not a symbol for anyone from the past, her name is a blend of Abigail Faulkner and Jonathan Prescott. Abigail Faulkner came from and married into a family of social prominence. Her husband, Francis, had inherited his father’s extreme wealth but he was not a well man. And so, it was Abigail who had control of the family’s purse strings. This made her a very powerful and influential member of the community, not one as much revered as resented. 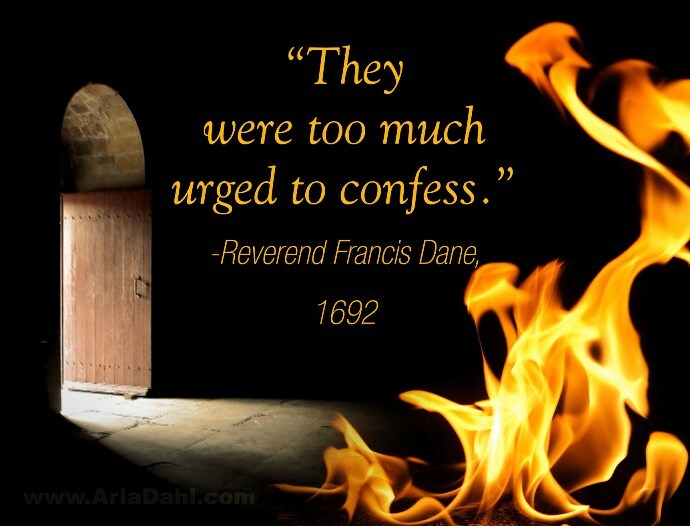 Adding to the resentment of her, was her father, the Reverend Dane, who openly questioned the testimony – the honesty – of the afflicted, and the methods used to extract confessions from those accused. Eventually, the reverend himself, Abigail’s sister, niece, sister-in-law, two daughters and even herself, would be accused of witchcraft. Abigail’s daughters, aged 9 and 12 were freed once they confessed guilt and, after much questioning, had conceded that their mother was a witch. Abigail was arrested, tried, convicted and sentenced to hang. There was a hitch in the plan to put her to death, however. Because of that, she was granted a temporary stay of execution. Her hanging would not take place until after the birth of her child. Fortunately… or unfortunately… for Abigail, while she was imprisoned, her husband, an ill man already, had become an invalid. With her in prison, soon to die, and he unable to care for their children, she petitioned the governor, pleading for clemency, so she might be with and care for her husband and children. Her father had petitioned the governor as well, clearly stating his concerns about the legitimacy of the trials. The governor granted Abigail’s request and she was released, as were the remaining members of her family. Released, but still labeled “witches”. It wouldn’t be until 1711, after years of trying, that Abigail’s petitions to clear her name and those of her relatives were finally granted. A disturbing course of events with several happy endings. Abigail was tried, convicted and sentenced to hang as a witch. There was a hitch in the plan to put her to death, however. Abigail Faulkner was pregnant.